As you know, on the official Widewalls Instagram wall art profile, we bring you the latest murals created around the world. 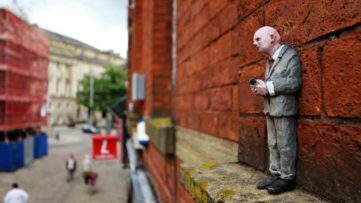 Same goes for our Facebook profile, home of street art filled with photos on a daily basis, and let’s not also forget our weekly Street Update. Our aim is to celebrate and promote the work of all the amazing artists out there, who are creating truly amazing pieces that go beyond amazing. Whether it’s up-and-coming or established artists, we’re there to bring them straight to you. Scroll down for your favorite Instagram wall art of July! The talented street artist from Poland Michał Wręga, better known as Sepe, recently had a solo show in London, UK, at Lawrence Alkin Gallery. 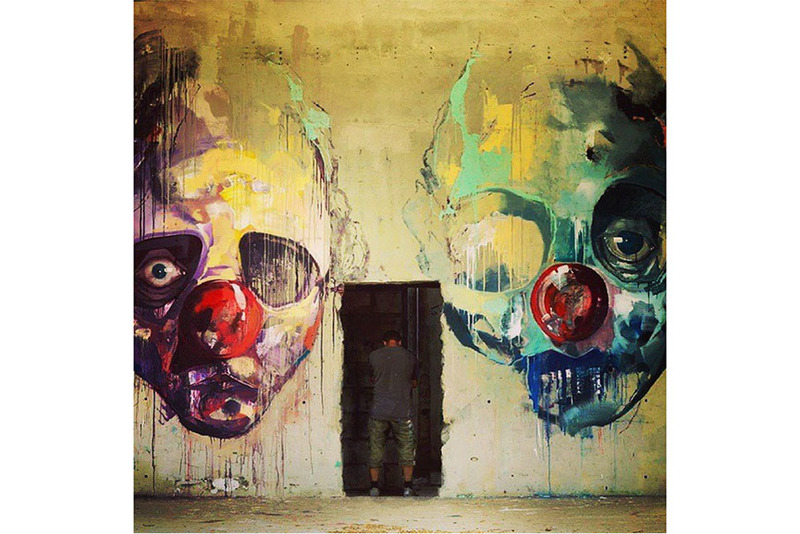 As an epilogue piece, he painted two murals entitled The Further You Go, featuring what appear to be colorful, half-empty skulls, wearing something like a clown red nose. His incredible picturesque painting style is characterized by beautiful, usually pastel colors, and Sepe likes depicting historic scenes, that way creating truly unique and recognizable pieces that often end up as part of our Instagram wall art. Sepe also does large-scale poster design and traditional book illustration. Another brilliant, highly distinctive artist we’re proud to have among our Instagram wall art – Dutch artist Handiedan. One of her latest pieces is called Bollywood Sugar, and it was done as part of the Wall Therapy street art festival in Rochester, USA. 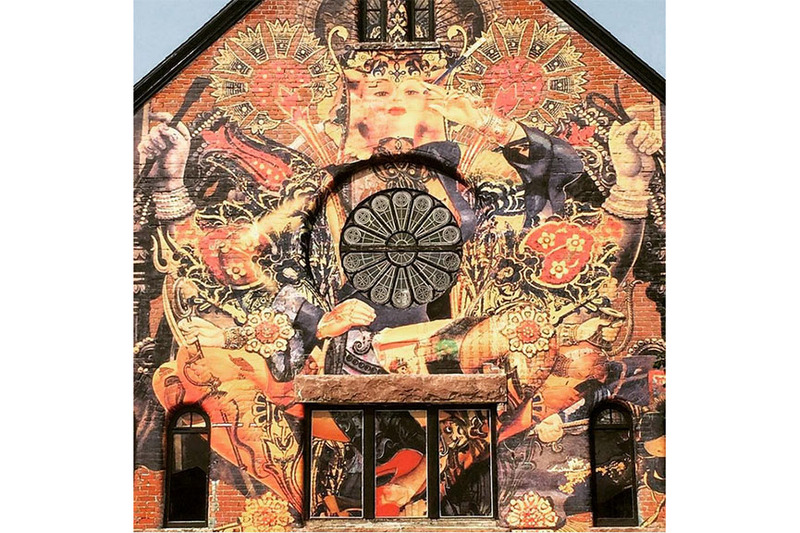 This spectacular mural is covering an entire side of a building, and it follows closely the artist’s complex cut and paste montage deriving from a computer sketch. Her works are hand-cut and highly detailed, accompanied by antique ornament frames. Handiedan mixes contemporary elements with Baroque and Victorian Neo-Classicism designs, as well as trademarks of many cultures around the world. 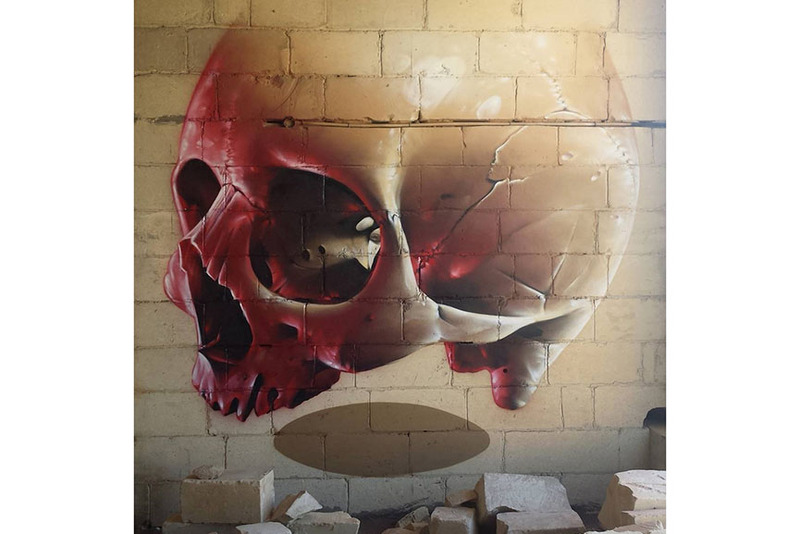 The Australian street artist Smug was featured in our latest Street Update, with that amazing skull piece created for Malta Street Art Festival 2015. This photo-realistic painter is currently based in Glasgow, Scotland, who creates some incredibly beautiful work of women, famous character portraits, and bizarre/humorous scenes. Alongside him, painting the beautiful Mediterranean island there were Valentina Sforzini, MrDheo, Vera Bugatti, Leon Keer, Odeith, and many others. Before Malta, Smug was busy painting walls in Dublin, Eindhoven, Werchter, Los Angeles, and many more. Ever thought of painting your own mural? 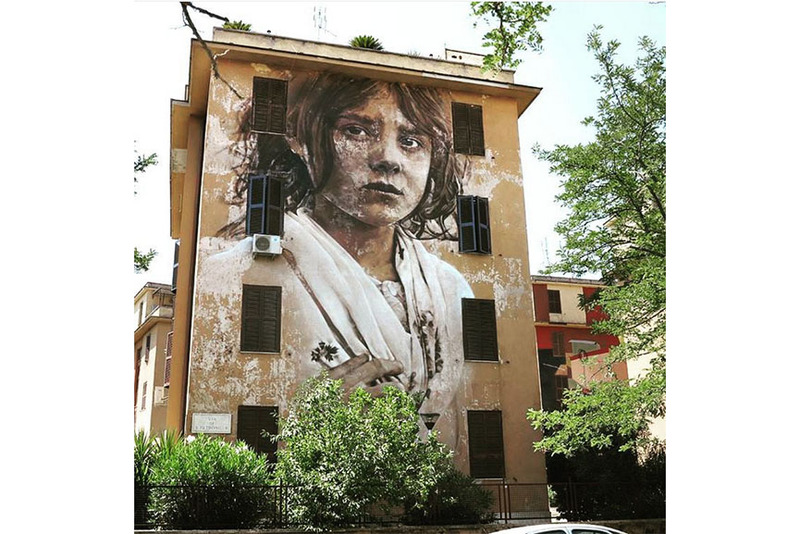 Guido van Helten is an Icelandic street artist who recently visited Rome, Italy, for a project organized by bigcitylife.it and 999Contemporary. This urban art initiative aims to revive the city’s Tor Marancia district. Guido van Helten joined the project and our Instagram wall art with a piece entitled Io Sarò (I Will Be), and the painting is a reworking of a photograph by Francesco Paolo Michetti. Guido van Helten is known for his monochromatic portraits which grace the walls around the world. He usually works with watercolor, and his art is often deeply nostalgic, sentimental and evokes vintage photographic portraits. 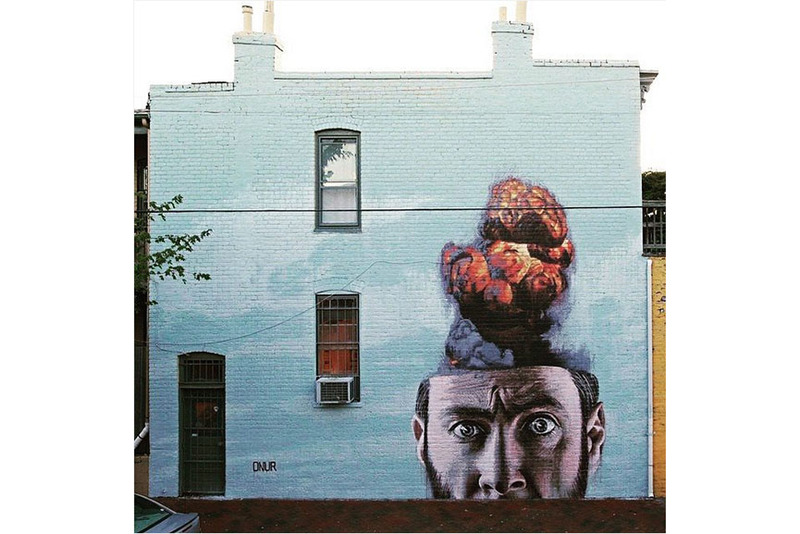 Swiss street artist Onur Dinc, also known as Onur, participated at the Richmond Mural Art 2015, organized by Art Whino Gallery, a DC based gallery. For the festival, which ended on July 28th, Onur created a great piece entitled Overthink, featuring a portrait of a male whose head literally explodes with thoughts. Depicted on a lie background, the piece follows the artist’s trademark hyperrealistic painting style, which often depicts human psychology, open heads with different things coming out of them, using different techniques to make them. In Richmond, Virginia, Onur painted alongside artists like D*Face, Evoca1, James Bullough, Moya and many others. 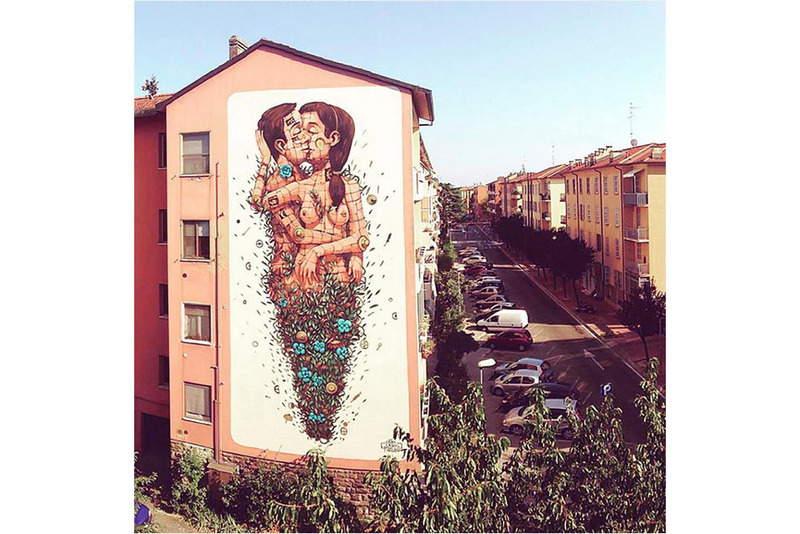 This great piece from Ravenna, Italy, titled The Last Kiss, was also featured in one of our recent Street Updates, but also as part of our Instagram wall art. Marco Bertolli, aka Pixel Pancho, is an Italian urban artist whose large-scale murals combine ancient mood with robotic technologies, usually building his characters. These characters are then usually in love, or perhaps they’re animals, hybrid creatures that cover entire walls or building facades. 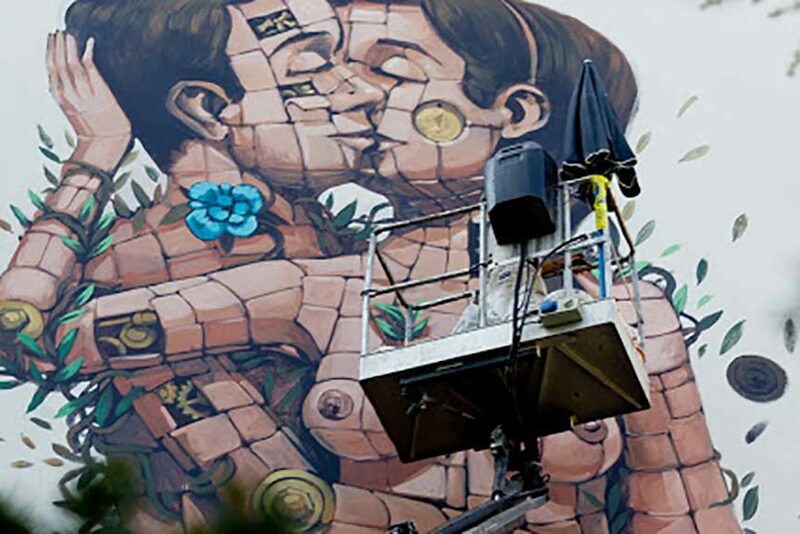 Pixel Pancho uses different techniques in his painting, such as tiles, sticker and poster art as well. He admits that one of the greatest influences on his work was Salvador Dali. Did you see our Top 10 Instagrams in June? 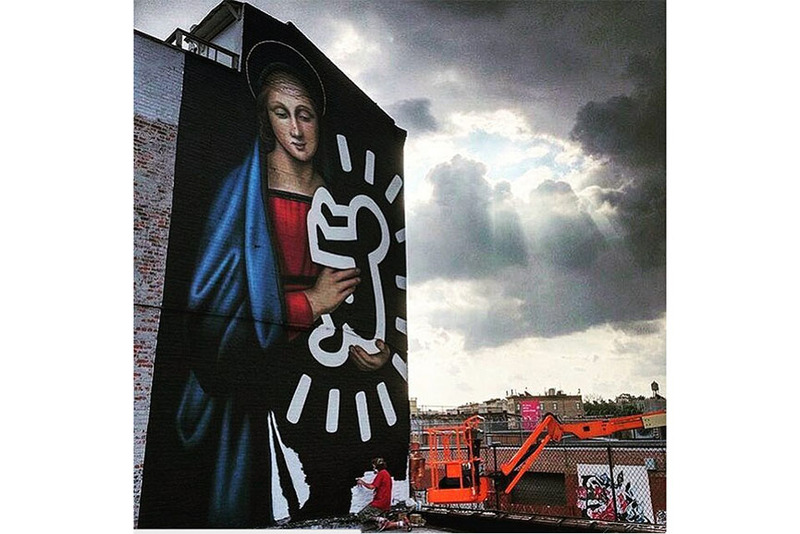 An apparent fan of Keith Haring, New Zealand street artist Owen Dippie created an amazing mural in Brooklyn’s street and and graffiti mecca, the Bushwick Collective. The enormous mural sees the traditional image of the Madonna, holding baby Jesus – but not just any baby Jesus. 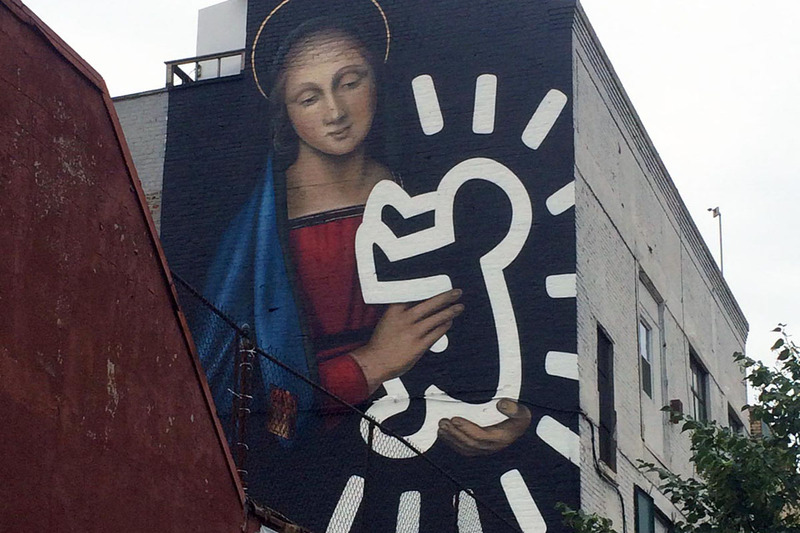 He is the radiant baby a la Keith Haring, and that’s why the piece is named The Radiant Madonna. Owen Dippie is an artist whose art is quite influenced by painters like Raffaello, while still keeping touch with the contemporary masters. One of his most famous pieces features portraits of Donatello, Raffaello, Michelangelo and Leonardo with colored strips covering their eyes, like Teenage Mutant Ninja Turtles. 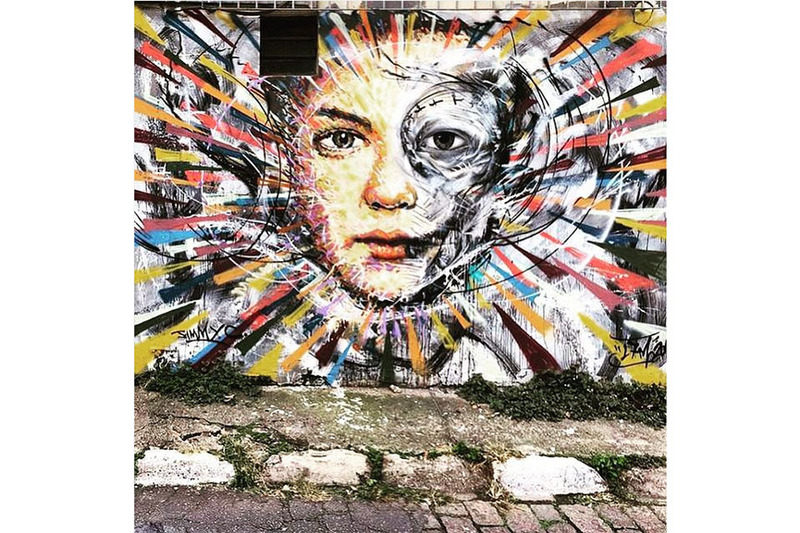 Street artists James Cochran, aka Jimmy C, and Luis Seven Martins, aka L7m, recently collaborated on a great mural in Sao Paulo, Brazil, as part of the the Instagrafite, the biggest street art gallery in Sao Paolo. Both artists are known for their comprehensive use of a wide color palette, so the piece is an incredible explosion of colors and forms and a great addition to our Instagram wall art. The two artists are also collaborating on another piece, only this time in London, which sees only an eye soaked in pinks and purples. We are definitely excited that these two are working together, and let’s hope they will continue to do so in the future! Since 1994, a street artist under the name of Rocket01 from the United Kingdom has been creating amazing street art. 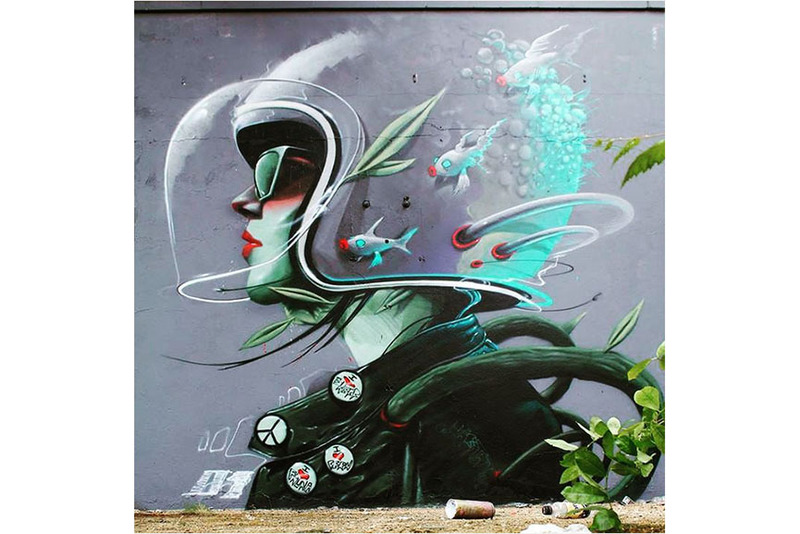 One of his latest pieces is called Habitat, painted in Sheffield, and it featured a portrait of a lady wearing a helmet, in an environment that seems to be under the sea. Rocket01 created another mural in Sheffield shortly after Habitat, called Aeroaquatic, which also sees a person immersed in the sea, only wearing a space suit. 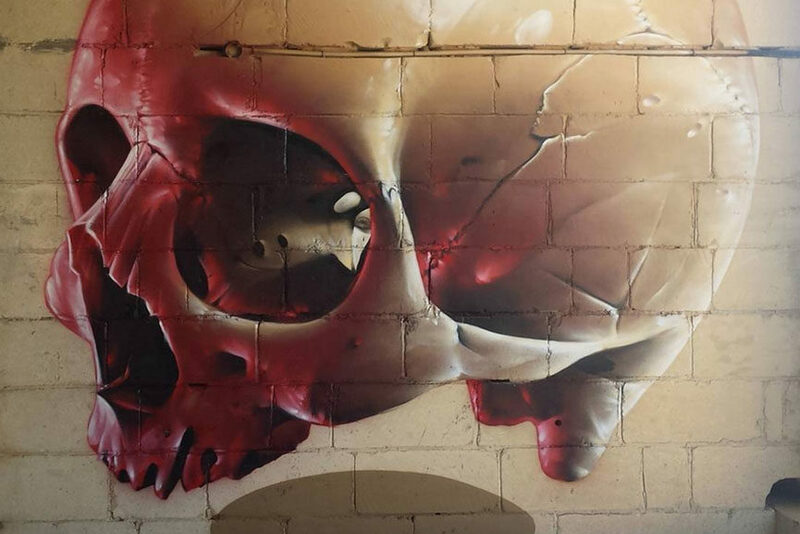 Rocket01 specializes in graffiti, street art and fine art, that often involves elements of nature, science, organics, and is grouped according to his characters. 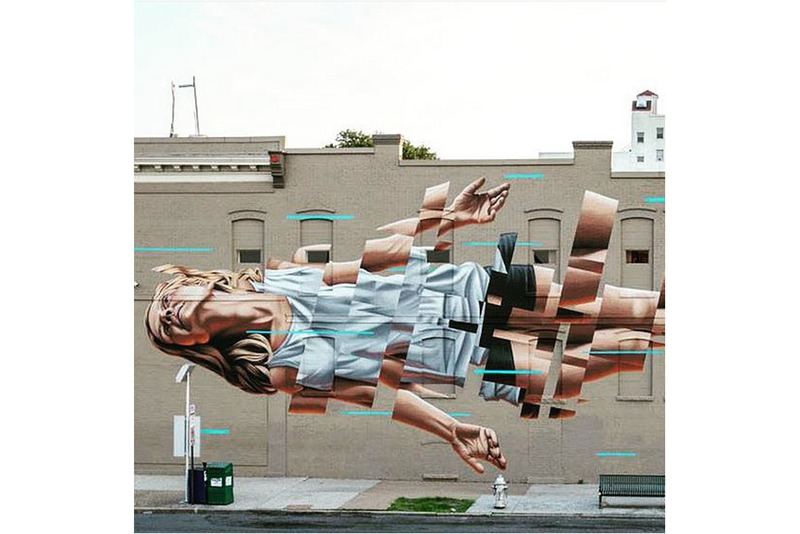 As the final piece of the best Instagram wall art in July, we have the American artist based in Berlin, James Bullough, who created a stunning mural for the Richmond Mural Art 2015 in Virginia. 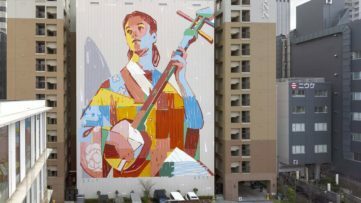 The artwork sees a “dissected” girl floating across the wall, and it took eight days to finish. A few years ago, the artist transitioned from photorealistic oil paintings to photorealistic spray-paint murals. 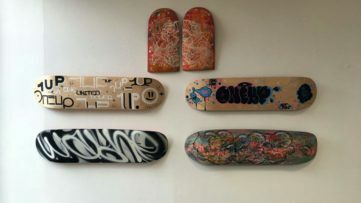 He is also the co-creator and host of VantagePoint Radio, a bi-weekly interview show focused on Urban art and its artists. So far, there are 43 episodes of the show, the latest featuring a talk with artist SNIK. Don’t miss out on the best Instagram wall art – sign up for My Widewalls today!